Spanish Architect Ignasi de Solà-Morales coined the term terrain vague to describe the abandoned, ambiguous, or marginalized pieces of land within an urban landscape that stand in contrast to the otherwise cohesive, definable organization of the city. These kinds of spaces – abandoned lots, post-industrial sites, bridge underpasses, for example – define the character of a cityscape through these pauses and stutters of visual dissonance. My intention with this work is to expand on Morales’s notion to use it with a bit of poetic license in order to describe a sense of longing I find so prevalent in these Central Maine landscapes. The empty storefronts, the spaces between modest homes, and vacant lots are for me filled with the beauty, despair, yearning, and disappointment that define this time in history in many places throughout the world. In a sense these photographs are anti-scenic; they do not present us with beautiful or idyllic spaces. 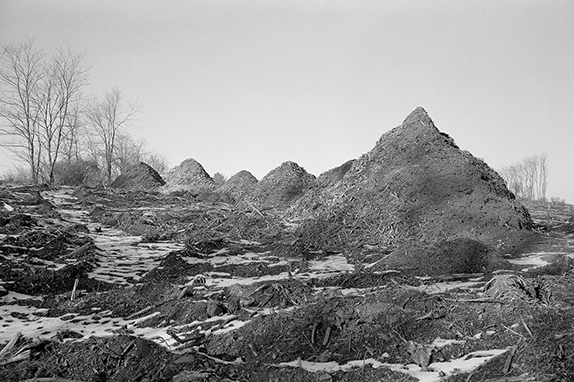 The images are filled with a sense of passage, decline as well as the ordinariness of utility pared down to the basics: the piling of soil, the scraping of the earth, the fencing in of property. Some of them are layered so that trees and brambles hide a home, a human story. These are the spaces we barely bother to attend to visually, all the more reason to give them further attention.